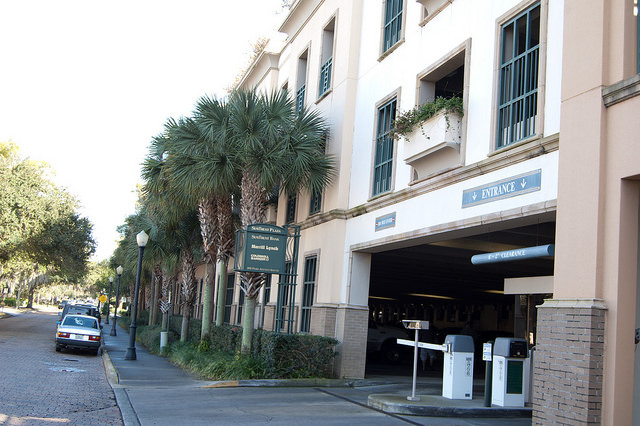 Rollins is set to begin another construction project, costing over $9 million, as a new four-story parking garage is set to be built in the Ollie Parking Lot. Construction will start this semester between Holt Hall and Sutton Place Apartments. A specific date for construction has not been set. Construction will force the 106 parking spaces reserved for junior and senior students to be temporarily lost. While the Ollie Lot is closed, overflow parking will be directed to the SunTrust parking garage located off of Park Ave. When completed, the new garage will offer four levels of structured parking and contain 777 spaces reserved for faculty, staff, and students, according to Ed Kania, vice president of Business and Finance. While the overall price for the project is still being calculated, Kania anticipates that it will cost around $12,000 per parking space—equating to $9.32 million in total cost. Part of the construction will be completed during the summer, but those 90 days will not be enough time to complete such a large project. Therefore, reduced parking in the fall is inevitable. Rollins has been in a continued state of construction and disruption with multiple different projects going on across campus. Kania said that the Ollie garage is being added to the list of construction projects in order to meet the code requirements of the new lakefront student housing project. Disruption is nothing new to WPRK-FM (91.5), Rollins’ student radio station, which is currently housed in the Stewart Building next to the Ollie lot. As of mid-January, the station was notified that they must move to a new location by Friday, Feb. 1, according to Sydney Rock (‘20), station manager of WPRK. “This will be our second time moving in less than a year, after being promised that Stewart House would be the only place we’d be in until the new studio was complete,” said Rock. The station moved to Stewart over the summer to make way for the remodeling of Mills Memorial Hall. “The majority of the moving process is placed on the student staff. Now we are forced to balance our schoolwork, our work as the staff, any extracurriculars, and moving to a still undetermined location has been added on top of it all,” Rock said. Rock also said the current plan is for Rollins to provide a portable trailer until Mills is finished. She said that this is still unconfirmed. WPRK is run by over 15 student staff members along with over 100 volunteer DJs who come in weekly to host two-hour shows. Rock said that the constant movement has had a heavy impact on these students and volunteers, and, since it is no longer centrally located, the station’s visibility on campus has diminished. Start and end dates for construction have not yet been confirmed, but more information on this will be available in mid February.